Christmas Celebration to thank our wonderful volunteers for their commitment and hard work throughout the year. Award success for our work with volunteers & placements! Group photo of our volunteers taking part in the pumpkin carving competition. 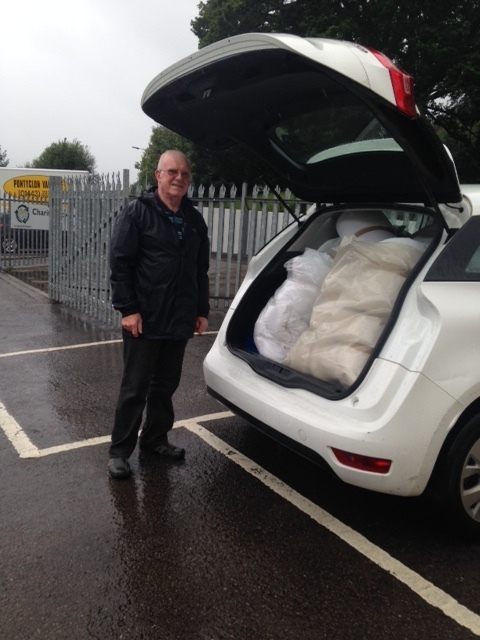 On a daily basis we gratefully receive donations of household items from the kind residents of Rhondda Cynon Taff. We also work with partner organisations and are members of the Furniture Re-use Network (a national organisation). Through this relationship, August saw us receive an enormous donation of preowned bedding and pillows from the Ministry of Defence. We decided to offer them free to Animal Rescue Centres to be used by the animals in their care. It’s then we decided that the best way to reach as many centres in need was to use the power of social media and put the post on our Facebook page. Whilst we have a healthy regular following on our page, we were not prepared for the speed and extent of the coverage we had. We were soon almost inundated with messages from people suggesting organisations and charities who would benefit from bedding – including some from rescue centres themselves. That one simple post expressing an appeal to animal lovers went on to reach over 935,000 with more than 12,000 sharing the post! We had contact from people from Scotland, Spain, Cyprus, Canada, America and even as far flung as Australia. We had over 600 duvets to distribute so two staff members and a volunteer responded to all the messages and requests and had them allocated in just over a day! 24 different rescue centres across the country (and Europe) benefitted from the ‘duvet day’. From the local dog pound in the Rhondda (on our doorstep), the Ty Nant Cat Sanctuary in Port Talbot through to Jodies Cyprus Dog Rescue and many more were relieved to know the animals in their care had warm bedding. Almost immediately we started to welcome some of the rescue centres to our showroom in Ynyshir who were coming to collect the duvets as soon as they could. One of the first to arrive was Mair Gibbs, a volunteer for Many Tears based in Carmarthen and she said “These duvets are a godsend; they will help make our dogs more comfortable and help keep them warm in the coming months as we move into winter”. We helped fill her car with as many duvets as we safely could. Many Tears rehome over 2500 dogs each year and the demand for clean bedding is enormous. So after all the various rescue centres had collected their allocation we still had a load of pillows left to find homes for. We contacted Many Tears once more to see if it would help them to fill a van and deliver them personally. As we were already going to Swansea for a collection, we thought it would be better to put the empty, outgoing van to good use. They were delighted with the delivery and flabbergasted with the amount of pillows stuffed into the back of a 3.5 ton van! We have been overwhelmed by the response of the animal loving general public who have helped us fully distribute the bedding to the animals that need them. We are delighted that we have been able to help so many rescue centres who are using our donated duvets to care for their animals. Finally we would like to extend as massive thank you to our team of volunteers for sorting the duvets and pillows to get them ready for collection and to the volunteers of the rescue centres who came to collect the bedding from us. 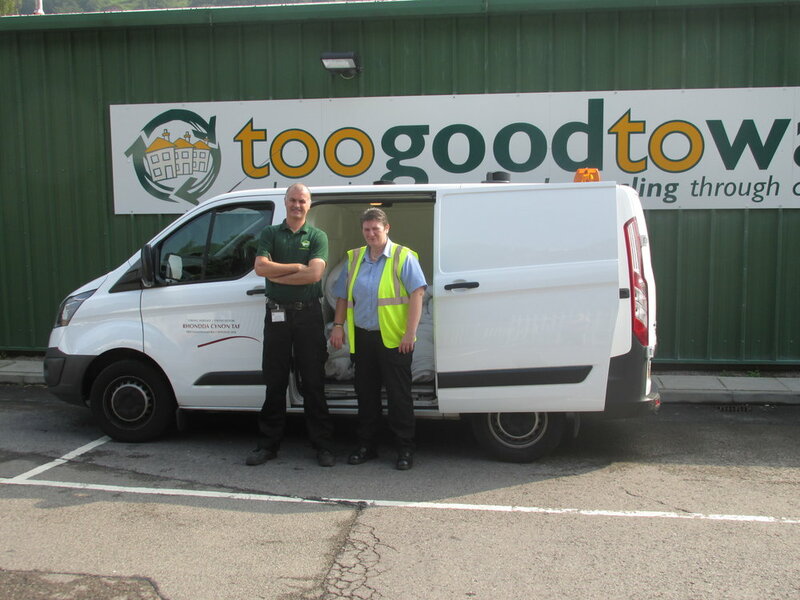 This feat of animal bedding delivery would not have been possible without their support – thank you from all of us at toogoodtowaste. A Big Thank You to all our Volunteers! 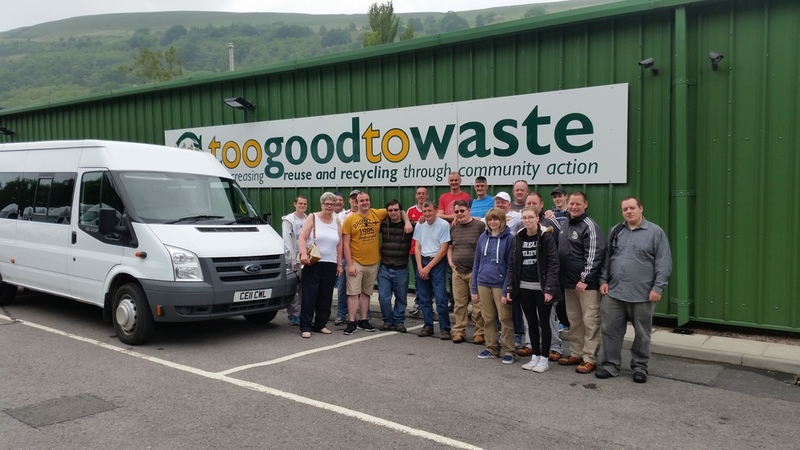 The team here at toogoodtowaste largely consists of a wonderful, diverse group of volunteers and placements who are committed to helping us help our local community each and every day. To show our appreciation for their dedication and hard work, we organised three day-trips for them during Volunteers Week. Each volunteer could choose their favourite option from a selection of places to go to that would appeal to them to ensure they had a great day. With a hired minibus driven by one of our van drivers and lunch for everyone provided by a local café we were set for a fun few days. The first of the three trips took the thrill-seekers of the bunch to Oakwood Theme Park. At 8am, we left for a full day at the park. On arrival everyone headed for the big rides and despite a power cut, their spirits were not dampened one bit. Instead they headed off to eat or enjoy the working rides until the issue was resolved. The highlight of the day was at the Waterfall ride when the more fearless volunteers took to the slides in an effort to make it to the end without getting drenched, needless to say, not many did! Day two saw a smaller team enjoy a more relaxed outing to Bristol Zoo. Everyone enjoyed strolling around the zoo looking at all the different animals and walking around the gardens. The monkeys were a big hit and the group enjoyed spending time by them. The final trip took the remaining volunteers on a mystery trip. Everyone was trying to guess where they were going before they had left and they continued to guess on the bus. As the bus got closer to the destination, a few guessed correctly that they were heading to Cheddar Gorge and Caves. First it was the caves that were explored and afterward they all boarded an open-top bus for a ride around the area – this proved a big hit with the team! All in all, everyone who went on the trips enjoyed spending time with each other outside toogoodtowaste. It allowed people to get to know other volunteers better, including some they had never met due to working on different days. Once again, we would like to thank everyone for their continued and much appreciated support and for making toogoodtowaste such a great place to work. We salute you! Inaugural blog post from our brand new website!